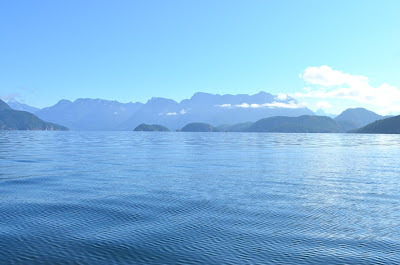 Over the last couple of days I’ve emailed with another C-Dory owner about trying to meet up somewhere in Desolation Sound, and Roscoe Bay ended up being the chosen place. I’d been there several years ago and wanted to go back. There’s a great swimming lake and a good hike. 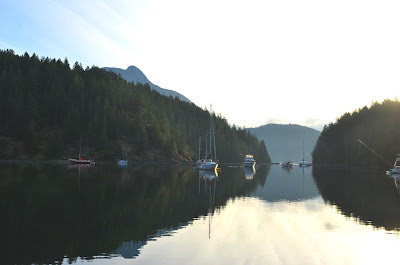 I was up pretty early and headed out of Von Donop Inlet. Roscoe Bay is about 23nm away, and it would take most of the morning cruising at displacement speed. The sun was shining again, the temperature was warm, and the wind calm, so it was a pleasant trip over to Roscoe Bay. I arrived around noon. The anchorage was already fairly crowded, but I found a suitable spot to drop the anchor and settled in. I kayaked up to the head of the inlet, wandered around by the lake, and took a swim. 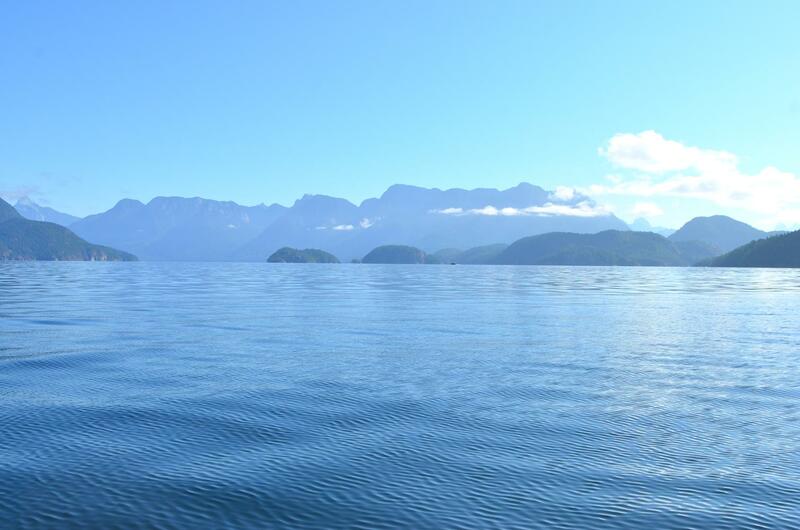 One of the nice parts about Desolation Sound is the number of lakes around. They’re warm and inviting in the summer and offer a welcome spot for small boat cruisers to clean up. After the swim I went back to the boat, made lunch, and read for a bit before Brian, Ann, and Dylan arrived on their TomCat (the catamaran C-Dory). They rafted up to me and we had a nice afternoon and evening comparing and contrasting boats and cruising areas. Brian has built a very clever davit system to get a rigid dinghy on the roof of his boat, as well as a lot of other customizations that make the TomCat a better cruising boat. It’s a lot bigger than a 22.